Operation Mercury, the Battle of Crete, was joined on 20 May 1941 when German airborne troops parachuted onto the Mediterranean island. The bloody battle lasted eleven days, it resulted in the German capture of the Allied-controlled island. Crete had offered valuable harbors for the Royal Navy and airfields for RAF bombers, so its loss was keenly felt. What is perhaps not so well known is that German Gebirgsjager (mountain troops) played a significant part in the operation alongside their airborne brethren. The 5th Gebirgs-Division had a force of 15,000 men in three infantry regiments (85th, 100th and 141st) and an artillery regiment (95th), and it was inserted by air and sea as a follow-up force. This task was made easier by the capture of Maleme airfield on the second day of the battle. The Gebirgsjager were ideal for the task as they had light weapons, were easily moved by air, and could handle the mountainous terrain of Crete. 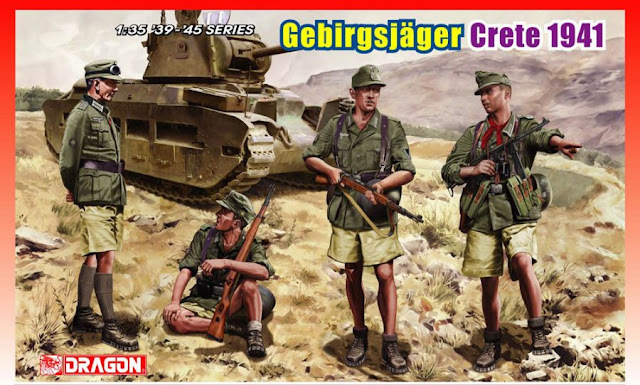 Dragon’s latest 1/35 scale figure set features four Gebirgsjager soldiers from the Battle of Crete. 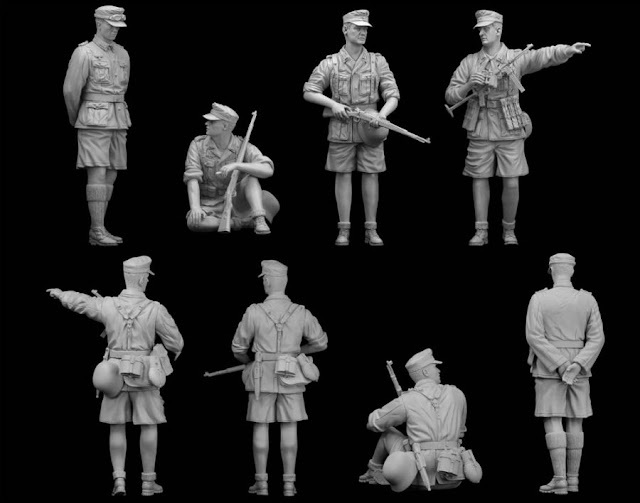 The plastic German soldiers are sharply moulded and their uniforms and personal equipment are accurately depicted. To suit them for summer combat in the Mediterranean, they are all wearing cotton shorts instead of their usual battledress. These shorts give the soldiers a unique appearance. On their heads are distinctive caps with the edelweiss emblem, while their feet are shod in typical mountain boots. They carry a complement of light weapons such as Kar98k rifles and an MP40 submachine gun. The poses of these Gebirgsjager are lifelike, with two taking a brief rest from combat, while another two prepare to move further over the rough terrain. These versatile German figures from Dragon are ideal for a Crete scene, or even for some other warm-weather battle elsewhere. Check out Dragon’s site for more of their new kits..